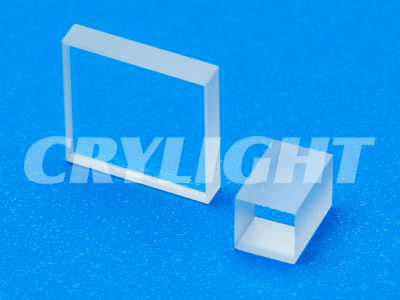 NLO Crystals | CRYLIGHT / CRYLIGHT Photonics, Inc. | レーザー機器　専門商社｜株式会社アルクゥズ　ALQUZE Inc.
Lithium Triborate LiB305 or LBO is a newly developed nolinear optical crystal.It is unique in many aspects,especially its wide transparency range,mechanical properties.Its transmission range is from 0.21?/im to 2.3 ?/im.LBO Crystal allows temperature-controllable non-critical phase-matching(NCPM) for 1.0-1.3?/im.Type I SHG ,and also provides room temperature NCPM for typeII SHG at 0.8-1.1?/im.It possesses a relativey(dn?0-6/cm) and being free of inclusion Relatively largequality requirements for sours lasers.Features:Broad transparency range from 160nm to 2600nm High optical homogeneity(dn?0-6/cm) and being freeof inclusion Relatively large effective SHG coeffcient(about three times that of KDP) High damage threshold(18.9GW/cm2 for a 1.3ns laser at 1053nm)Wide acceptance angle and small walk-off Type I and Type II non-critical phase matching(NCPM) in a wide wavelength range Spectral. Lithium Triborate LiB305or LBO is a newly developed nonlinear optical crystal.It is unique in many aspects,especially its wide transprency range,moderately high nonlinear coupling,high damage threshold and good chemical and mechanical properties.Its transmission range is from 0.21>mto 2.3 >m.Type I SHG ,and also provides room temperature NCPM fro Type II SHG at 0.8-1.1>m.iIt possesses a relatively large angular acceptance bandwidth,reducing the beam quality requirements for source lasers. 1 Broad transparency range from 160nm to 2600nm (SHG range from 550nm to 2600nm). 2 Type I and type II non-critical phase-matching (NCPM) over a wide wavelength range. 4 High damage threshold (18.9 GW/cm2 for a 1.3ns laser at 1054nm). 1 Wide acceptance angle and small walk-off. 2 High optical quality (homogeneity Dn≈ 10-6/cm) and free of inclusion. 1 High power Nd:YAG and Nd:YLF lasers for R&D and military applications. 2 Ti:Sapphire, Alexandrite and Cr:LiSAF lasers. 3 Medical and industrial Nd:YAG lasers. 4 Diode laser pumped Nd:YVO4, Nd:YAG and Nd:YLF lasers. 5 Frequency-tripling (THG) of Nd:YAG and Nd:YLF lasers. 6 Optical parametric amplifiers (OPA) and oscillators (OPO) pumped by Excimer lasers and harmonics of Nd:YAG lasers. 7 Frequency doubling (SHG) and tripling (THG) of high power Nd:YAP laser at 1340nm. 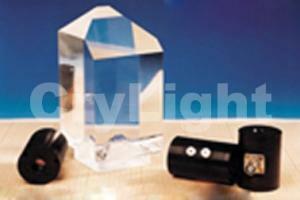 9 Large crystal with size up to 10x10x30 mm3 and maximum length of 35 mm. u AR-coatings, mounts and repolishing services. 11 Mass production line to support OEM applications. 12 Unbeatable prices and special OEM discount. 13 Fast delivery, in-stock crystals in a large quantity. 14 Precision oven and temperature controller for NCPM SHG. 1. Dual-band AR-coating of LBO for SHG of Nd:YAG lasers. 2. Broad Band AR-coating for frequency doubling Ti:Sapphire laser. 3. Other coatings are available upon request. 1. LBO has a very low susceptibility to moisture. Users are advised to provide dry conditions for both use and preservation of LBO. 2. Users are advised to cautiously protect polished surfaces of LBO. 3. CryLightengineers can select and design the best crystal for you if parameters of your laser are provided, for example, energy per pulse, pulse width and repetition rate for a pulsed laser, power for a cw laser, laser beam diameter, mode condition, divergence, wavelength tuning range, etc. 4. 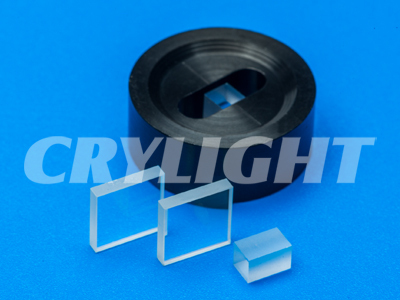 CryLightprovides mounts and sealed housing for LBO crystals. Potassium Dihydrogen Phosphate (KDP) and Potassium Dideuterium Phosphate (KD*P ) are among the most widely-used commercial NLO materials. They are commonly used for doubling, tripling and quadrupling of Nd:YAG laser at the room temperature. In addition, they are also excellent electro-optic crystals with high electro-optic coefficients, widely used as electro-optical modulators, Q-switches, and Pockels Cells, etc. * Protective coating is required to prevent polished surfaces from fogging. * Anti-reflective coating should be considered if low reflectivity is required. LiNbO3(Lithium Niobate) crystal has high mechanical and chemical stability, good physical properties, wide transparency range as well as high optical homogeneity. LiNbO3 crystal is widely used as frequency doublers for wavelength > 1mm and optical parametric oscillators (OPOs) pumped at 1064 nm. Due to its large electro-optic and acousto-optic coefficients, LiNbO3 crystal is the most commonly used material for Pockels Cells, Q-switches and phase modulators, waveguide substrate, and surface acoustic wave(SAW) wafers, etc. High quality and large size LiNbO3crystals, waveguide substrate and SAW wafers are available. MgO:LiNbO3 (Magnesium Oxide Doped Lithium Niobate) crystal has similar effective nonlinear coefficients to pure LiNbO3 and exhibits higher optical damage threshold. 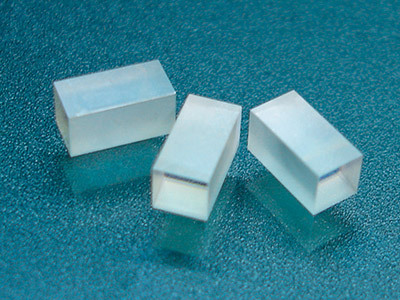 KTP crystal is mostly used as nonlinear crystals for frequency doubling of solid-state Nd:YAG crystal or Nd:YVO4 crystal laser, as it has large nonlinear optical coefficients, wide angular bandwidth and small walk-off angle, broad temperature and spectral bandwidth. KTP crystal also has high electro-optic(E-O) coefficient and low dielectric constant, and large figure of merit, these features make it also widely used in electro-optic application. BIBO (BiB3O6) is a newly developed Nonlinear Optical Crystal. It possesses large effective nonlinear coefficient, high damage threshold and is non-hydroscopic. It’s nonlinear coefficient is 3.5 – 4 times higher than that of LBO, 1.5 -2 times higher than that of BBO. It can efficiently frequency doubling the 946nm to produce blue laser at 473nm. 20 years experience | High quality | Competitive price| 7days delivery | Japanese coating machine. The BBO Crystal is an efficient NLO crystal for the second, third and fourth harmonic generation of Nd:YAG lasers, and the best NLO crystal for the fifth harmonic generation at 213 nm. Conversion efficiencies of more than 70% for SHG, 60% for THG and 50% for 4HG, and 200 mW output at 213 nm (5HG) have been obtained, respectively. BBO Crystal has the following. 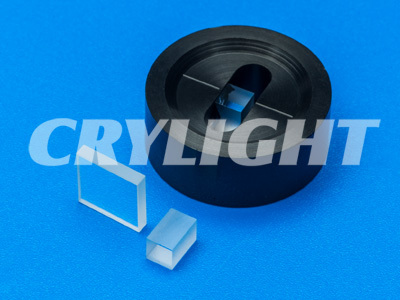 Mounting: In order to prevent crystals from damaging or to be easily operated, CryLight provide three kinds of mount of holder to install different dimension crystals. Please contact our sales for more information.